Thornhook is an off grey bulbous plant native to the Shivering Isles. 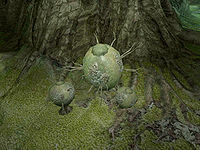 It grows in the cave systems of the Dementia region. They are covered with long thorns. 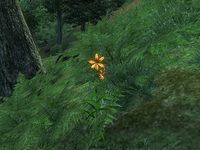 Tiger lily is a tall orange flowing plant found in the Great Forest, Blackwood, and along the Gold Coast of Cyrodiil. 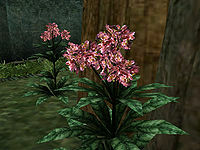 Timsa-Come-By flowers are a small pink flower found in the city of Mournhold. 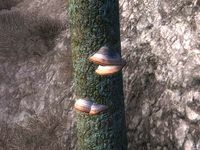 Tinder Polypore is a pinkish mushroom found on trees across the Valus Mountains as well as the Jerall Mountains. They grow in groups of three or four and seldom found singly. 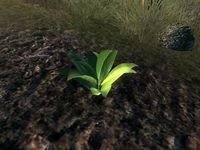 Tobacco is a thick-leaved plant found on many farms in Cyrodiil. Tomato plants are long vines with tomatoes flowering from the stem. 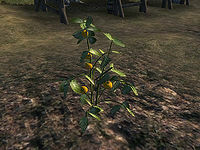 They are a common crop on farms in Cyrodiil. In Wrothgar, a variant known as "glacial tomatoes" are grown. Orcs believe the cold soil gives them a richer flavor. 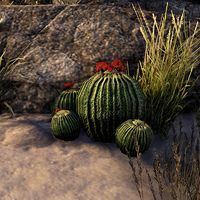 A cacti found in the Alik'r Desert. The extracted powder is sometimes used by the Ash'abah in rituals. Trama shrubs are the dry, thick shrubs of the Ashlands, Molag Amur, and Red Mountain regions of Vvardenfell, as well as the Ashlands of Solstheim. Their thick bitter roots are harvested to make into tea. 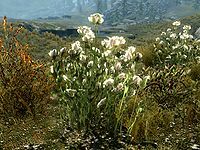 Slender but hardy Tundra Cotton plants mainly thrive in the plains west of Whiterun. Tundra Cotton is used to make many of the fabrics in Skyrim; alchemists also use it to make potions fortifying magicka. This page was last modified on 6 November 2018, at 12:57.